World Banknotes and Coins, Foreign Currency from Around the World. Old Money, Currency Notes. World Banknote Gallery - Huge collection of world banknotes images pictures with description and tons of information about World Paper Money. 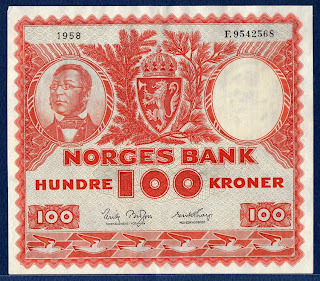 The second issue was issued from 1901 to 1945, without any major change in design. The issue was withdrawn and demonetized in 1945, after the end of the war. 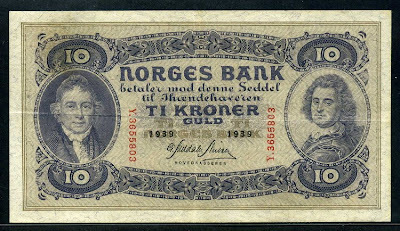 The German occupying power had printed large amounts of notes to finance their activities in Norway. 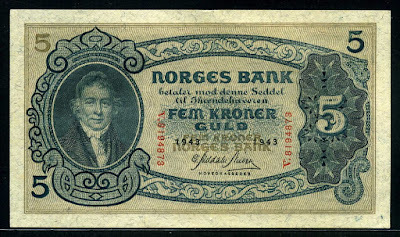 The 4th issue of Norwegian kroner notes was the first post-war issue that was designed as a long-term issue, the 3rd issue having been prepared during the war for use in a monetary reform situation and was introduced when the 2nd issue was suspended in the autumn of 1945. 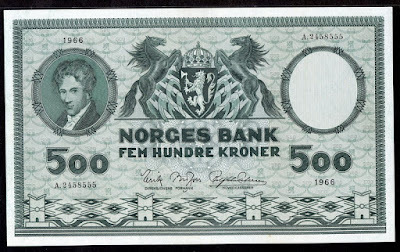 The 4th issue consisted of 6 notes, 5, 10, 50, 100, 500 and 1000 kr. The 4th issue obviously is an attempt to "build the country" after the war. 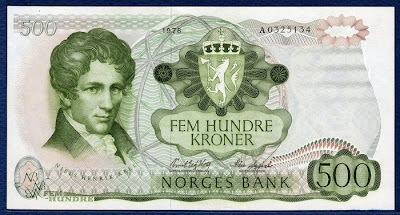 Each note has its own portrait, with famous Norwegians. The reverse is used to visualize one of the important sectors of the Norwegian economy and society. The 5-kroner is the fisheries note, the 10-kroner is shipping and commerce, 50-kroner farming, 100-kroner forestry, 500-kroner industry and 1000-kroner the arts.